Our firm’s founder, Steven Siegfried and I are very pleased to have prevailed on behalf of one of our community association clients before the Third District Court of Appeal in the opinion filed this Wednesday, Dec. 17, in the case of Deutsche Bank Trust Company Americas v. Harry Beauvais et. al. 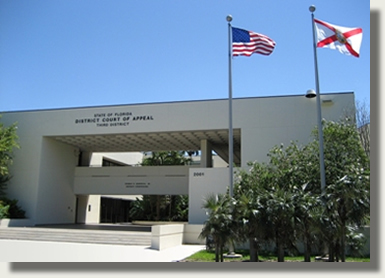 The appellate panel affirmed the Miami-Dade Circuit Court’s summary judgment that I had secured earlier this year barring Deutsche Bank from foreclosing on its $1.43 million first-mortgage on a penthouse at the Aqua Condominium in Miami Beach which the association had acquired ownership of in 2011 through its own foreclosure action. Since the bank failed to file its foreclosure action within the five-year statute of limitations period, it was barred from seeking to collect the amounts due under the mortgage (click here to read the blog article that I wrote on the circuit court’s decision). At the trial court level, we successfully argued that the bank had “started the clock” for the filing of its foreclosure action in January, 2007 when its loan servicer filed the initial foreclosure suit and accelerated the amounts due under the mortgage. The foreclosure was dismissed when the lender’s attorneys failed to appear at the initial case management conference in December, 2010. For unexplained reasons, the bank then waited until December, 2012 to file its second foreclosure action, nearly a full calendar year after the five-year statute of limitations had expired. The circuit court granted our motion for summary judgment declaring the first mortgage held by the lender unenforceable, null and void and discharged of record from the penthouse unit. The bank appealed the circuit court’s judgment. Along with our co-counsel Todd Wallen, we successfully countered the bank’s contention before the appellate panel that its second filing represented a new foreclosure action. The Third DCA determined that the initial foreclosure suit triggered the commencement of the statute of limitations and, thus, the filing of the subsequent action, after expiration of the statute of limitations, was therefore barred. As a result, the Third DCA affirmed the circuit court’s order that the lender was barred from foreclosing on its mortgage, but it reversed the court’s finding that the bank’s mortgage was null and void. The end result is that although the mortgage remains on the property until its expiration, the lender is precluded from taking any action to collect the debt, thus allowing the association to continue to rent the unit without fear of an eventual foreclosure action by the lender. This opinion is emblematic of the ultimate negative consequences that lenders are facing due to their failure to timely enforce their rights. After years of suffering due to the dilatory tactics of lenders, an association has finally caught a break and will benefit by this ruling. Every citizen of this state is bound by the applicable statute of limitations, and the Third DCA made it clear that banks are no exception. The ruling represents the first appellate opinion on a decision barring a lender from foreclosing on its mortgage due to the expiration of the statute of limitations, and it is likely to be considered by the Florida Supreme Court which is set to hear a similar case.